We are very proud of the Lakelovers team who successfully completed the icy Great North Swim across Windermere last weekend in particularly ‘challenging’ weather conditions. So bad were the windy conditions that the Sunday swim was scrapped but luckily our challengers got to take on the 1 mile challenge on the Saturday instead. Being fortunate enough to live in the beautiful Lake District, our competitors were lucky to be able to take advantage of some recent warm spells and take to our beloved Windermere over the last month for some light training and acclimatisation. This was so valuable, not to just get used to the cold water, but also to get used to swimming with some form and technique whilst wrapped in neoprene! Our Lakelovers team decided to opt for no rubber socks (would slow us down) and knowing about the awful weather conditions just wanted to be able to complete the challenge without ending up in the rescue canoe. Swimming in open water is a challenge, even for confident swimmers, and certainly requires training, practice and lots of guts! 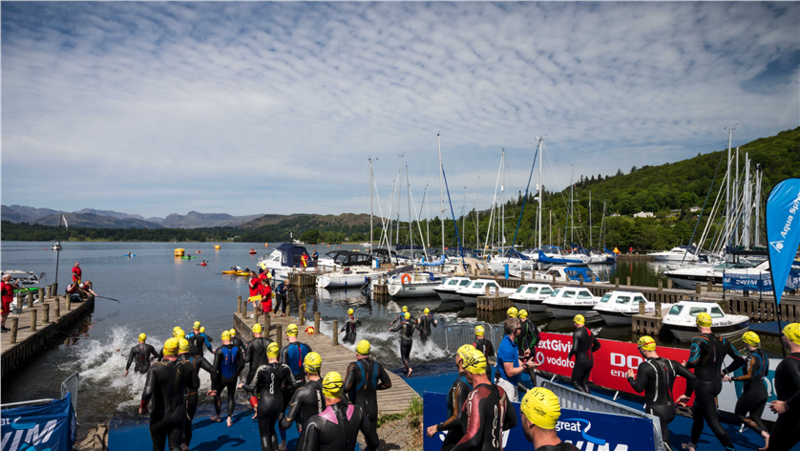 This is the 9th year of the Great Swim, taking its name from the popular Great North Run half-marathon, and Windermere has always been its host. And what a host she is. This year England’s largest lake welcomed over 10,000 entrants who brought friends and family along to watch the spectacle. Indeed it is one of the UKs largest mass participant sporting events. 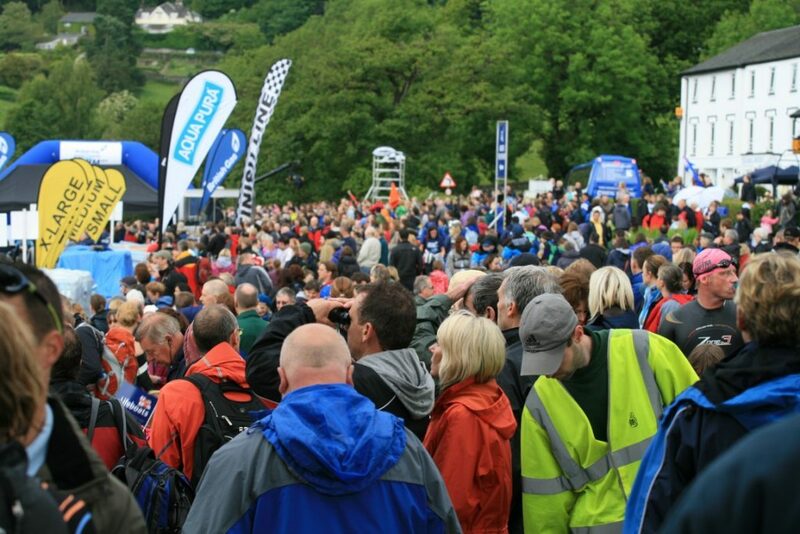 There’s plenty on so spectators can make a day of it, with the likes of GoApe and a climbing wall providing family entertainment and ‘Made in Cumbria’ sustenance from Kendal Crepere, Hallsford Farm and a Texas style BBQ served by non-other than a former Rodeo Queen. It was all lots of fun, but there is a serious side to the metal and grit that our entrants had to find to complete the training and brave the dark waters and unknown creatures and waterlife on the day. Some Lakelovers representatives were raising money for important local charities and have been humbled and driven by the support that people have shown in donating. So, our competitors trained hard and had their own separate charities at the forefront of their steaming-up goggles. But no-one can account for weather on the day, and boy was it it choppy. With mixed feelings, they donned their red swimming caps and took to the waters, which was a sea of choppy white froth and looked like a salmon river in Autumn when the fish are trying to swim upstream! Once completed the mile swim, a hot shower followed hugs and cheers of relief and victory, followed by pictures on the podium with the coveted medals. Whilst there were plenty of big names at this event, Olympic athletes and such, what is particularly appealing about this sporting occasion is that it attracts so many differing abilities. For many amateur open water swimmers this is a great opportunity to use the event as something to focus on. As the latest Nike slogan instructs; ‘Don’t exercise. Train’. Open water swimming brings mental challenges along with the physical and so is makes for a very interesting competition. If you’re new to open water swimming but would like to give it a try, Derwent Reservoir hosts regular training events. It’s easy to turn yourself from a spectator into an athlete with open water swimming. All you really need is a wetsuit. And of course lots of nerve. Be prepared to meet some great people, have a laugh and get stuck in. There is the added plus of the health benefits of swimming in cold water, plus the pint of well-deserved beer afterwards tasted pretty good. Lord Byron, one of the Lakes Poets is said to have been the pioneer of open water swimming and what better place to take part than in lake Windermere. Information on the Great North Swim 2018 competition can be found here and our Windermere cottages provide quality accommodation fit for all occasions. A final huge well done to all who took part.